Fits perfectly and is just the right weight for summer. Wish it came with a bed skirt though or that you offered a coral in it. 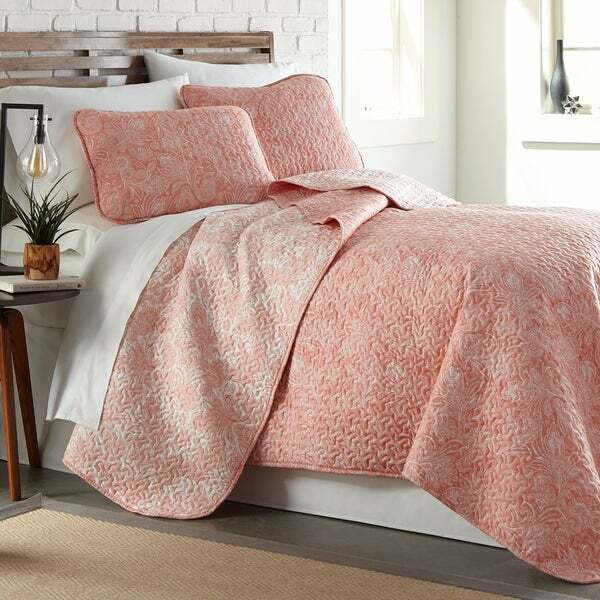 Silence your mind and embrace your inner calmness with our Perfect Paisley Reversible Quilt and Sham Set. Our global henna inspired paisley print beautiful embroidery combined with the sweet gentle tones of blue, coral, and taupe will make your bedroom the most sacred place in your home. Made of the highest quality the softness is unbeatable. Crawling into bed has never been easier and getting out of bed so hard. Soft quality bedding at an affordable price is Southshore Fine Linens promise to you. Purchase risk free with a 1-year limited manufacturer warranty. Dimensions 108.0 In. X 98.0 In. X 1.0 In. The quilt looks great and the shams are much easier to use than most others since the pillow goes into the end instead of the middle. My only criticism is that it feels a little bit stiff. I’ll add another star if it softenes up. Top quality. Love it! Was made for Hotel chain in Las Vegas according to the manufacture tag. It's beautiful and will look so lovely in my new bedroom, painted a light blue. The quilt i have is blue, not the color shown here. Once we move, in a few weeks, i will be able to take pictures to show you. So very happy. Definitely recommend to you! I bought this for a gift for someone who lives at the beach. It’s bright and airy looking and offers just the right amount of warmth. The color is more of s coral and looks beautiful in the newly painted room in the beach house . You hardly see the paisleys as they are small which allows one to see almost one color. Great for brightening up room. I'm happy. Color true to the picture. Like that it's reversible and the lightweight is just right. I'm happy it's the quality too. Loved the color and pattern.